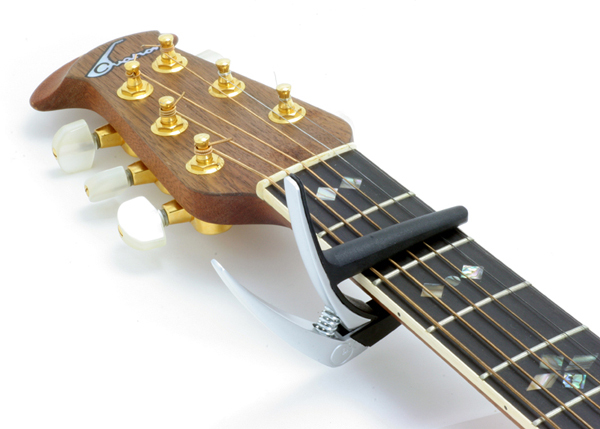 A capo is a small guitar tool which you can use to easily change the "key" of music you are playing. As you learn the guitar you'll notice it is used regularly by many musicians and in many songs. Different capos have different mechanisms to attach them to the guitar but they are all simple to use. Attach the capo across your chosen fret and make sure it's firmly attached. To check you've attached it properly, pluck each of the strings. They should sound clearly without buzzing or sounding muted. A capo goes over the neck and presses down across all six strings at a certain fret on the guitar. Once you've attached the capo you can play all of your normal chord shapes using the fret where the capo is as the new 0. This means you can easily play a whole range of new chords without having to learn any new chord shapes. If you put the capo across the fourth fret you are making all of the strings fours steps higher and making your chord progression sound four steps higher. The song Eagle Eye Cherry - Still Having Fun is a good example of this and it uses a capo on the fourth fret. You can use our list of beginner guitar chords with your capo. And you can use our beginner guitar songs to experiment.